Oh my God! This movie was great. 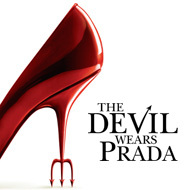 My friend Michael invited me to join him last night for a sneak preview of The Devil Wears Prada. It was so damn funny I thought my sides would split. I don't know if Meryl Streep will win an Academy Award; but she'll certainly be nominated. She plays Miranda Priestly - the most evil, horrible boss any assistant would want to work for. And she was ruthless and wonderful at it. Ann Hathaway is great as Andy - Miranda's assistant. I won't go into the humor of the movie but it is uproarious bitchy and catty. This movie makes me want to read Lauren Weisberger's other books. I envy the screenwriter for her cutting wit and sarcasm. This movie opens to the public on June 30, 2006 - and you should be there to see it.